Whitchurch Museum & Archives is a member of the First World War Centenary Partnership with The Imperial War Museum (IWM). 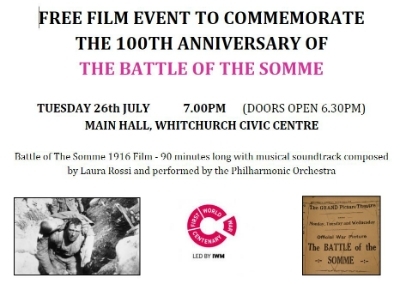 As part of this group we have been able to borrow a copy of the UNESCO listed film The Battle of the Somme for the people of Whitchurch to view. It was shot and screened in 1916 and was the first feature length documentary about war and changed the way both cinema and film was perceived by the public. In the year of its release around 20 million people, almost half the population of Britain at the time, watched The Battle of the Somme many hoping to see the image of a loved-one, or friend captured on film. One hundred years later, this unique film from IWM’s collection, is being shown to commemorate the anniversary of the Battle of the Somme. at The Grand Picture Theatre on Station Road. Come and relive the experience your ancestors had 100 years ago when they watched the same film. This entry was posted in News and tagged Film, Somme. Bookmark the permalink.